Birch Lake | Northern Wilderness Outfitters Ltd. This lake is located 200 miles northwest of our airbase. 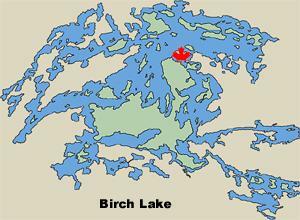 Birch Lake is over 25 miles long but is broken up by hundreds of islands and bays. In fact, you would not have to leave the bay the cabins are located in to catch all of the fish you want. 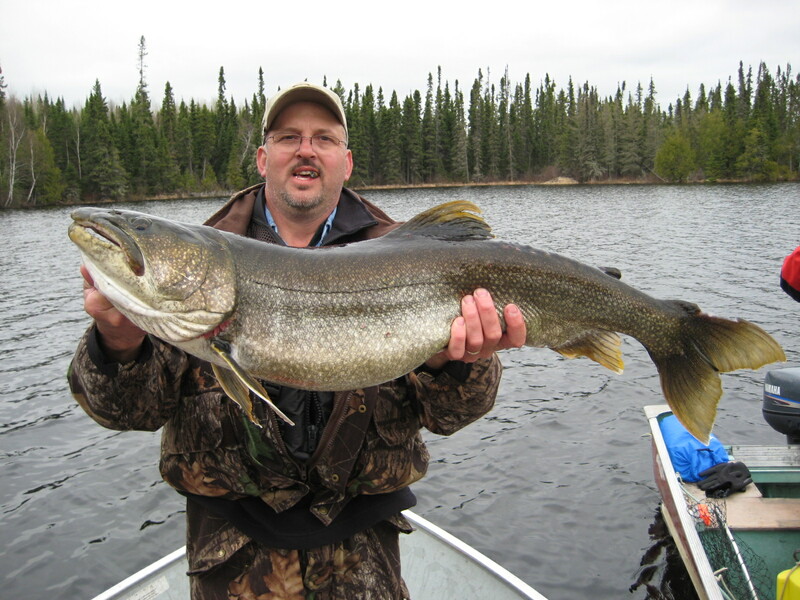 This lake is noted for its larger walleyes, lots of northerns, and a chance to catch lake trout over 20 pounds. 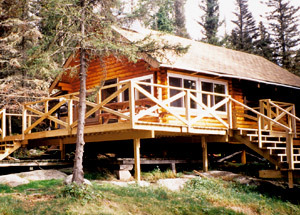 We have built two beautiful log cabins that are tucked away in one of Birch Lake's fish-filled bays. These cabins are about 75 yards apart and have their own separate dock for your parties' privacy. 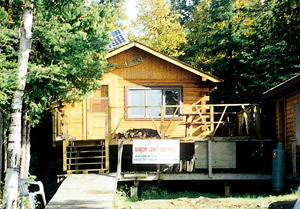 The west cabin can accommodate parties of 6-8 fishermen and the east cabin can accommodate parties of up to 12 fishermen. Each of these cabins is equipped with a 16' x 16' gazebo with a screened-in porch and a hot shower room. The cabins have running water, solar lights, large gas freezers, large gas refrigerators, large gas barbecue grills, 6" inner spring mattresses on bunks, comfortable den furniture, patio decks, and fish cleaning houses. Add new 14' Lund boats with swivel padded seats, 9.9 hp Yamaha outboard motors, and you have yourself a great fishing trip lined up. 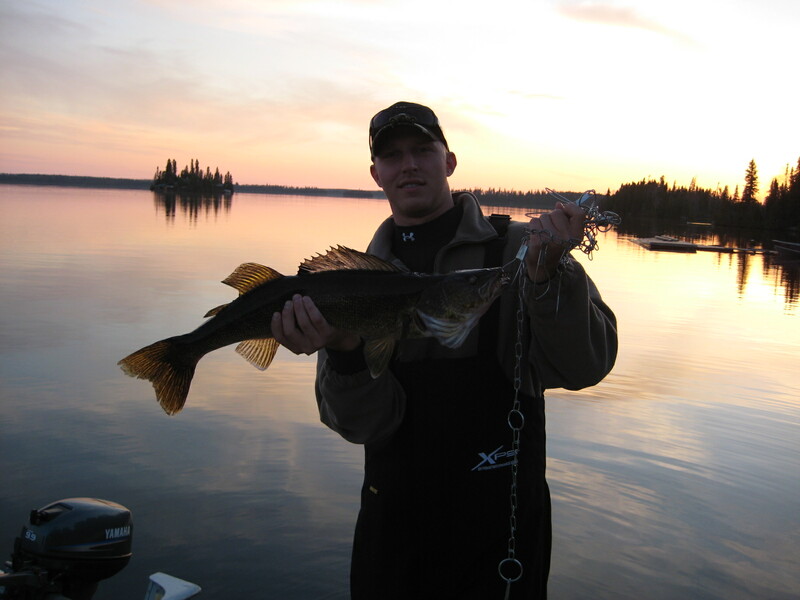 If you like to have lots of room to explore and move around then you will enjoy Birch Lake. If anybody knows of a better fishing lake and can top our outpost accommodations on Birch Lake give us a call and we will buy it! Party of 4-5 $1425 ea. U.S.
Party of 6 or more $1325 ea. U.S.